Padri Prem Bhaghat (پادری پریم بھگت) was a preacher, minister, spiritual guide and Christian song-writer who will be remembered for both his pastoral services and his songs. He was born in a Christian family of a small village, Glotiyan khurd ( گلوٹیاں خورد ) in the Sialkot District of India (now in Pakistan). His date of birth is recorded as 1st January 1910. His father was a minister with the Church of Scotland Mission. Bhagat received his elemenatry education in his village and then moved to Christian Teaching Institue (CTI) to complete his middle grades. It was during this time that he suffered first major loss of his life, as his father died and the young Bhaghat was left alone to fend for himself and his family. Being deeply influenced by his father and having a natural aptitude for theological studies he gravitated towards his future calling. He often visited his maternal uncle Jallal, an employee of the railway department, who lived in Thata Faqir walla (ٹھٹہ فقیر والا ). There he met a local missionary Padri A. M. David who trained him and appointed him as a evangelist in the area called Kot Inayat Khan in 1934. Then between 1934 and 1936 he received further theological training at Daska Divitnity School before returning as a preacher in 1937. In 1965 while serving in Sohdra (سوہدرہ) Bhaghat was appointed as a Padri and for rest of his life he carried this title with dignity. It is reported by those who knew him that God used him mightily for his work and that through his prayers many were healed. Dispite being a clebrated song-writer, and much sought after minister, he never acknowledge any human being as his mentor and guide. His own testimony often included words to the effect: God has taught me without a teacher. In the prefaces of his books Padri Prem Bhaghat has thanked many people in connection with the selection and editing of his songs, these include: Padri B. M. Khanda, Master Nadeem, Padri Sadiq Haie Mall, Dr. A. N. Nadeem, Padri Khair Deen, and Bishop W. G. Young. This seeker of the Crown of Life slept in the mercy of his Savior on the 4th February 1982. Masih, Professor Padri Rehmat, (Wazirabad: Saet Iqbal, Christian Town Ahmad Nagar Road, no date). A native of Lahore, Pakistan, Issac Sosheel ( آئزک سوشیل ) is well known both in the Christian community as well as the wider Urdu speaking public. His contributions to the world of Urdu journalism are significant and have earned him an enduring place among the writers and journalists. He has also been recognised as a successful playwright for the plays which have been televised from PTV, Alif say Dall tak, Doosra Rhuk, and Teesri Barr are worth noting here. Following is a very concise overview of his career. He earned a BA from the University of the Punjab (Pakistan), in 1966, and then ad MA, in Mass Communication (major in journalism) from the State University of the Philippines, Manila in 1972. His journalistic career has a lead him to some of most respected dailys and other periodicals of Pakistan. 1967-1969 Assistant Director, Kamal Pictures, Lahore. 1969-1978 Senior Sub-editor, Nawa-e waaqt (fortnightly), Lahore. Soheel's articles have appeared in many reputable newspapers and tabloids in Pakistan, including, Imroze, Mashriq, The Pakistan Times, and Jang. Sosheel is currently holds the charge for the daily Kundan Lahore, a nationally circulated Christan paper. Father Sundar was born in Mian Chanoo, Pakistan. 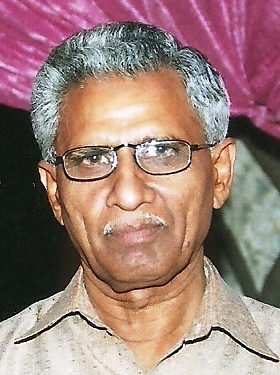 He completed his graduation in 1974, and then proceeded to study Theology at Christ the King Seminary in Karachi, where he finished his studies in 1976. Between 1977 and 1980 he served the Christian Community in Rahim Yar Khan. In 1984 he journeyed to Ireland to undertake a course in Justice & Peace, and then studied Mission Theology in Birmingham, successfully completing his studies in 1988. Father Sundar started writing in 1968. He acknowledges his debt of gratitude to his literary mentors, among which Saman S. Lall and Salik Rabbani are significant. And for his literary endeavours, he has been awarded by Humsookhan, Naqeeb, Kundan and Stoon-e Haq. He has contributed extensively to various Christian magazines in Pakistan. So far Siddique Mark Sundar has published two volumes of Poetry, Karrva Ghount (1989), and Zawiyay (1999). A teacher of recognized merit, an accomplished writer and a distinnguished academician, professor Yousaf Rehmat Nayyer, is respected by many for his academic excellence and his literary output. As an academic he is well suited for his role, having earned: BSc, BEd, DHMS, MDiv, MA and MPhil (Urdu). And as a writer his published works include Gul-e basharat (1987) گل بشارت , Hakeem Abdul Nabi Shajjar Tehrani - Fun aur Shakhsiyet (1995) حکیم عبدا لنبی شجر تہرانی- فن اور شخصیت , and Roshani ka pehla din (1999) روشنی کا پہلا دن . Nayyer has over forty years of academic experience. However during these years his activities have not been limited to traditional class room teaching alone. He has helped create literary awareness among hundreds, and has actively participated in many dynamic literary organizations. Included in these years are his services rendered a a professor at different colleges. He was the Chairman for the Department of Urdu at Government Murray college, Sialkot (2000-2006), executive member of Punjabi Adabi Sangat Sialkot (1985-1990), General Secretary Halqa-e Arbabab-e Zaouq, Sialkot (1986-2000), and patron-in-chief of Al-Faiz, Literary Journal of Murray College (2000-2006). Prof. Nayyer's columns have appeared in many national, and international newspapers and journals. Some of the religious songs he wrote are now included in the Sialkot Convection hymn book. His place among significant Urdu writers of this age has been assured by a thesis which has been written on his personality, life and writings the Punjab university (Pakistan), where he also served as a member of the Board of Studies, in the Department of Urdu. Nayyer has never forgotten his debt to his teachers, and in the Eastern tradition of paying life-long homage to them would like it to be known that significant among them were: Prof. Gulzar Wafa Chowdry, Dr. Agha Sohail and Nazeer Qaiser. His awards and honours recieved from various organizations cannot be listed here in enirity, but the following is a representative selection: Best jounalist Award, Sialkot Press Club ((1992), Sabir Memorial Award, Sabir Memorial Acadamy (1994), Joshua Fazal-uddin Liereray Award, PCWG (1997), Literary Award, Govenment Murray College Sialkot, (1998), Punjabi Adbi Sangat Award, London (2000), Mertorious Literary Achievent Award, Naulakha Church (2003) and Dr. Bishop John Joseph Shaheed Award, Mother Teresa Welfacer Society, Pakistann (2006). The recipient of the 1993 National Culture Award, and the founder-chairman of the Pyramid Arts Promotion Society, Mr. Mehmood Shamas is well-known writer and editor of books and magazines. He has previously served as a superintendent for the Lahore Meusem, an institution of cultural heritage managed by the Govertnment of the Punjab. He is currently serving as a book editor for the Nirali Kitabain, Lahore. He is also the Chief editor for Pak-Swedish Focus Magazine, and editor of the monthly magazine, Mudawa. He acknowledges Syed Ahmad Qazi as his literaray mentor and teacher. Over the last many years he has contributed volumiously to various reputabel magazines, among which are, khushboo, Nai Sooch, Nawa-e Waqt, Tadeeb, Humsookhan, Safar Namay, Catholic Naqeeb, and Shalome. A man of literary aspirations and social conciousness, Shamas is ever busy in his passions of juournalism, poetry, music, activities of social welfare and promoting the preservation of cultural heritage. To this end, there are several publications under process, and will be soon mentioned on this webpage.